Update: Intel has informed us that we will see updated drivers for Windows certified Thunderbolt devices that will enable hot plugging under Windows as well as address some of the behavior we've seen. Intel further informed us that MSI's board has not yet made it through the certification process and a lot of these teething issues will hopefully be addressed by then. I finally made the transition to a notebook as my desktop last year, a move many had made years prior. Quad-core mobile Sandy Bridge and good SSDs made the move simple for me, but Thunderbolt eventually made it near perfect. With only two drive bays in my notebook (I ditched my optical drive so I could have another SSD, something Brian Klug did back in 2010), there wasn't any room for good, high-performance, mass storage. Thunderbolt solved this problem for me. 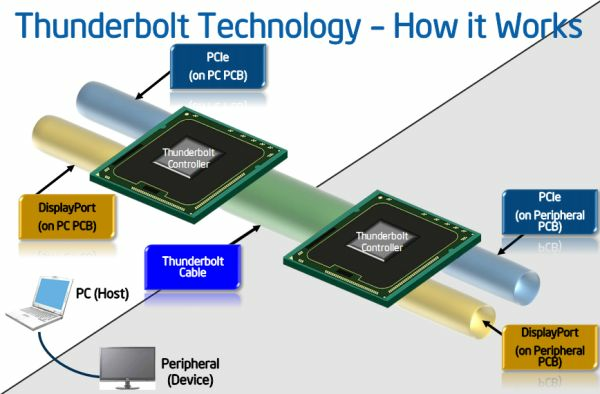 Co-developed by Apple and Intel, Thunderbolt is a tunnel that carries both PCIe and DisplayPort traffic to the tune of 20Gbps per channel (10Gbps up and down). In the past, whenever you wanted to add a PCIe device (LAN, audio, high-speed storage, etc...) you needed to physically install that device in your system either via an ExpressCard slot on a notebook or via a PCIe slot on your desktop. Thunderbolt acts as a decoupler for PCIe devices, allowing you to put controllers that would traditionally lie inside your system outside of it, or even inside another device like a display. That's where the DisplayPort support comes in. Apple's Thunderbolt Display is the perfect example of what Thunderbolt can be used to do. Take a DisplayPort panel, integrate Gigabit Ethernet, Firewire 800, audio and USB controllers and you've got Apple's Thunderbolt Display. In theory, you could connect a system that had none of these things, and the functionality would be provided exclusively by the display. Decoupling hardware like this allows OEMs to build thinner and/or smaller form factor machines (think Ultrabooks/MacBook Air), while allowing for full functionality when connected to a display. By carrying DisplayPort over the same cable, you can have a single cable that both extends functionality and connects your small form factor machine to a larger monitor. Thunderbolt enables the modern day dock for notebooks. For all of last year, Thunderbolt was an Apple exclusive. 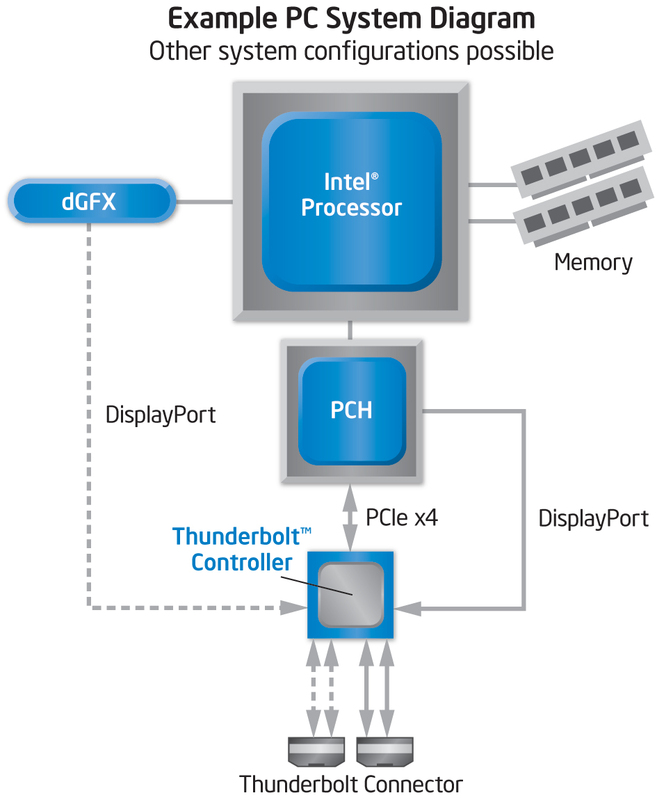 This year, starting with the launch of Ivy Bridge, Thunderbolt is coming to PCs. We'll see it on notebooks as well as some desktop motherboards. 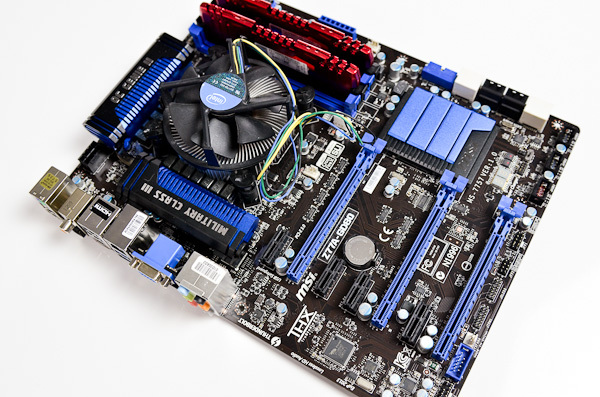 Today we have the very first desktop motherboard with Thunderbolt support: MSI's Z77A-GD80. Don't expect ubiquitous deployment of Thunderbolt, especially not on desktops, as the Thunderbolt controller and associated components add cost where margins are already very thin. Instead you can expect higher end motherboards to integrate it, or offer an add-in card of sorts which is the route ASUS is taking. I'd expect Ultrabooks to make better use of Thunderbolt naturally, but we will see it on desktops this year. Both CrossFire and SLI are supported. You'll find a standard eight SATA ports on the motherboard (4 x 6Gbps, 4 x 3Gbps, 6 driven by Intel's controller). USB 3.0 comes native thanks to Intel's Z77 chipset, with two ports on the rear IO panel as well as a header and a supplied bracket for two more ports. Intel LAN comes standard as well. Audio is driven by a Realtek ALC898 controller, while VIA's VT6315N powers the on-board Firewire header. The big news is of course the Thunderbolt port on the IO panel. Counting it, there are a total of three display outputs on the GD80, the other two are VGA and HDMI. I believe the Thunderbolt controller on the GD80 is this little chip on the board, just behind the analog audio outputs on the IO panel. It also looks like the controller branches off of the Z77 PCH's PCIe 2.0 lanes. Although there are four PCIe x1 slots on the board, you can only use two at a time - likely because of the way the Thunderbolt controller connects to the system as it uses 4 of the 8 available PCIe 2.0 lanes. The remaining lanes aren't enough to support the on-board LAN, Firewire, audio and SATA controllers in addition to the extra PCIe slots and Thunderbolt. As a result there are limitations on what you can use in parallel (e.g. you can't use Firewire and SATA ports 7/8) in order to deal with the PCIe overprovisioning. 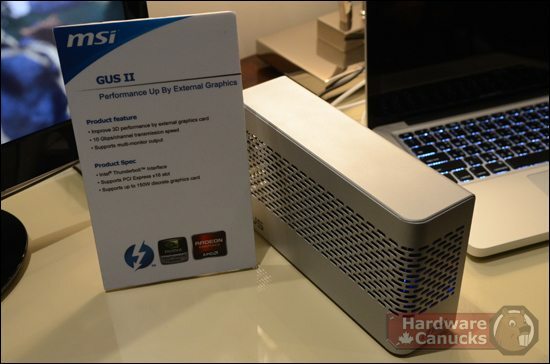 The markings on the Thunderbolt controller aren't familiar, so it could very well be that we're looking at Cactus Ridge - Intel's 2012 Thunderbolt controller we first heard about last year. 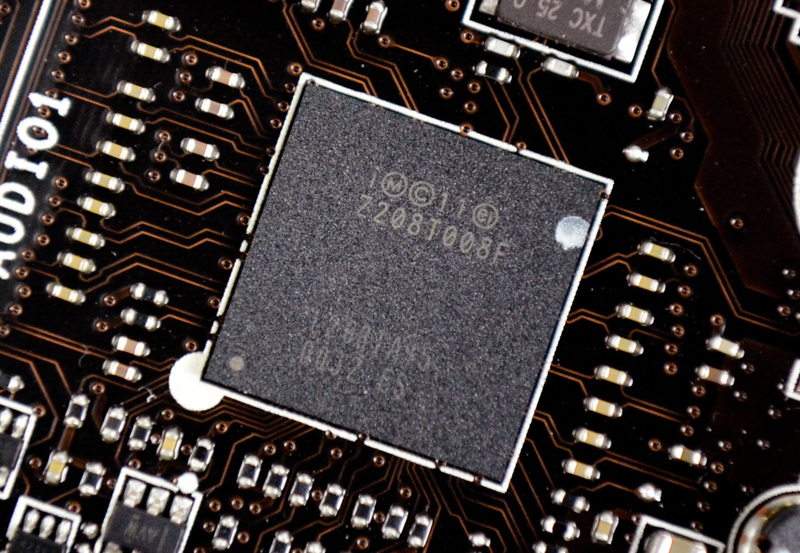 Cactus Ridge doesn't change performance, it just helps reduce cost by integrating more functionality into the controller itself. The beauty of Thunderbolt is it's near invisible to the OS. You don't need to install any drivers to take advantage of it, just plug your devices in and as long as your devices have driver support they'll just appear. The OS has no idea that your SATA, Ethernet or RAID controllers are sitting a few feet outside of your box, they all appear as normal PCIe devices. As we found in our initial review of Thunderbolt on the MacBook Pro, Windows does not allow for the hot plugging of Thunderbolt devices. You can remove a Thunderbolt device once in Windows, but you cannot add a new one. Anything you want access to in Windows has to be plugged in at boot. OS X allows more flexibility in this regard as you can add/remove Thunderbolt storage and other devices while the OS is running, but even then it's not always well behaved. It's not all that uncommon to need a reboot after plugging in a chain of Thunderbolt devices under OS X, although admittedly Apple has been improving compatibility and behavior over time.